Every teacher has his or her moments of glory; those moments when students rise above their expectations or when lesson plans go awry only to be salvaged by a completely unexpected situation. I say this with much candor. In all my years of teaching, many little things made me happy, feel appreciated and loved. Nevertheless, it was this one event in 2001 back in the Philippines, when I felt especially proud. It was an ordinary Tuesday morning and my students had settled on an activity that would set the stage for our lesson on World War II. The room was abuzz with discussion as I moved from one group to another, delighted that the case study I had given had kept them engaged. A couple of students were on the computer, a group was sprawled out on the floor while the rest were huddled together in their seats; as if discussing an ancient secret from the Middle Ages. Students always told me they looked forward to the lesson on World War II the most. With the many disturbing events happening in the country and in the rest of the world, I was not only pressured to make this lesson meet their expectations, but also make it as relevant to their present reality as the latest smartphone on the market. So when a sea of hands shot up in the air at my question, I knew I had started on the right foot. I still remember thinking this was going to be an awesome day. “Because the young college graduate can teach the children in the village, and all of them can help in rebuilding their community. “I agree,” another student chimed in. “We need people who can contribute something to give the village a chance to rebuild itself. Again, the noise seemed to reverberate outside the walls of my classroom. Everyone was justifying their choices with others who had thought differently. I was amazed at their engagement with the activity and how they vigorously debated among themselves. Despite the noise, I didn’t stop them. My goodness, I thought, this was every teacher’s dream! As if on cue, the noise level dropped and the room was now shrouded in silence. We all looked at Andrea, her pale face staring at the computer screen. I rushed towards her and with everyone peering from behind me, we listened to the short news report. There wasn’t much detail yet, but the video showing a plane hitting the Twin Towers was horrific. Back in the faculty room, everyone was talking about the same thing. We followed the news and though disappointed that I hadn’t been able to accomplish my lesson for the day, I wondered if there was a much bigger lesson here than the one written in our history book. As more details of the event came to light, my lesson took on a different shape and form, far from what I could have ever imagined. Two days later, I went back to my class and students barraged me with questions from our unfinished activity. Letting a moment pass, I slowly continued. Blank faces stared back at me. Others seemed to be struggling with the ideas I had just presented. Then, an unsure hand at the back of the class caught my eye. There were now murmurings around the room, each one finding strength in the one who had taken on my challenge. “But you made us choose!” asserted one girl. “Of course I did. You could choose any one of those people or you didn’t have to choose any one at all. That would have been equally a choice, wouldn’t it?” I asked. Once again, the class energy rose up. I walked back and clicked on the computer at my table, flashing it on the screen for everyone to see. “What happened the other day while we were having this discussion?” I asked. Students pointed to the screen with a picture of the plane that hit the Twin Towers in New York. I then asked if they had read anything else about this event. There was a tumult of voices, each one giving their own version of the news. “Apart from the World Trade Center, where else did the terrorists strike?” I asked. “Not just that. They also targeted the World Trade Center. Maybe they thought that would bring the US economy down,” a student added. “So they wanted to cripple the government and its economy?” asked another. The class suddenly broke down in wild applause. The connection between a simple class activity and the week’s recent events was finally made. My history class had never felt so alive and relevant. The question elated me. Thrilled by the skills students had displayed by their earlier conclusions, I wondered if they’d remember our original lesson. Slowly, I pulled down the world map and pointed at Germany. “. . . not with an 85-year old man, a one-legged boy and a 14 year old girl” a student completed the sentence for me. It’s been years since and while my other classes after that day experienced similar feats of energy, excitement and hunger for better understanding; no other event has brought us as close as being witnesses to history in the making. It was this feeling of being part of something that turned a simple World War II lesson into a deeply emotional and dynamic study of the human spirit. However, that serendipitous moment in 2001 doesn’t happen every day. Recycling the same lesson while retaining its relevance was not an easy task. Fortunately, I had the chance to visit the 9/11 museum in 2010. Armed with a pen and a notebook, I poured over the various memorabilia hoping to find something I could use to give life to my lessons. I wanted my present students to have a similar experience as my students back then. I wanted them to understand that these people who suffered were real, as real as they were to those who loved them. But much to my disappointment, the numerous literature, pictures, and artifacts spread around the museum only fed my professional curiosity. Even the videos and testimonials failed to make any connection. My feelings seemed divorced from any human anguish and no matter how much I tried, there was no way I could imagine or even fully understand their pain. I went back home disappointed, but carried on with my classes, and found other ways to enrich my lessons. Life, as they say, took over. Nonetheless, I knew something was missing. Three years later, I went back to the US. Not having managed to shake off the feeling that something was missing, a visit to the 9/11 Memorial was at the top of my list. Getting off the subway at Chambers Street, the new World Trade Center loomed in the distance. The sun shone brightly that day illuminating the majestic height of the tower even more. Inside the memorial, the mood was somber. There was a hushed silence despite the number of people that crowded both north and south pools. Set in the footprints of the original Twin Towers, a thirty-foot waterfall cascaded into a center void from each pool. Each had a low protective wall where the names of the victims were inscribed. Walking around the pools among the crowd, I noticed lone figures with their bowed heads in quiet reflection, or a couple or two with their hands stretched out on the stone, as if softly caressing the person whose name was etched on it for all eternity. Many times, I whispered a prayer and asked for peace for those whose lives were indiscriminately cut off; and comfort for those who still mourned for them. Three years ago, my visit to the 9/11 museum was motivated by my desire to make my history lessons as inspiring as I could. This time, though, it was a search for some missing piece I still couldn’t fully comprehend. Until a name inscribed on one of the walls of the south pool called my attention. The name was Ronald L. Gamboa. He was born on April 30, 1968 in the Philippines but had since lived in Los Angeles, California. He was a passenger on Flight 175. Like many others, he too died on that fateful day. I never knew or ever met Mr. Gamboa. But he was from the Philippines as I am. We spoke the same language, lived and breathed the same culture, probably enjoyed the same traditional dishes our parents and grandparents prepared for us. 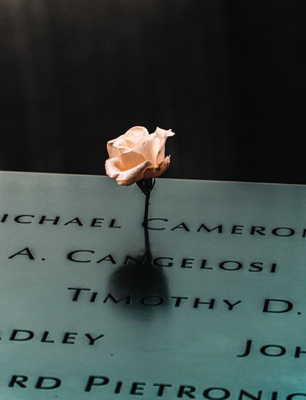 As I gazed at his smiling face on the Name Finder made available for visitors at the memorial, I felt a tightness in my chest. Something now clicked. 9/11 had started as an ordinary history lesson. Twelve years later, it had become painful too.